Royal Tokaji is releasing a fifth vintage of Essencia. This 2007 vintage release of 2,057 37.5cl bottles begins in the UK and Europe followed by Asia and US in September. The 2007 vintage follows on from 1993, 1999, 2000 and 2003. For the first time it will be available, in a six bottle wine merchants wooden box for collectors as well as a single bottle presentation box for gifting. Individual bottles are presented in a chic, black lacquer box, hand-made in Hungary. Each box contains a hand-blown crystal spoon, also made in Hungary, with which to serve, sip and savour this precious golden-amber liquid. Essencia is the world’s rarest and most concentrated essence of grapes. It has so little alcohol 1.65% that the legal definition of wine only applies due to a special exception. Perfect humid climatic conditions are needed to encourage and form noble rot, depriving the grapes of 90% of their juice and shrivelling them into rich raisins. Each berry is harvested individually. Back at the winery they are heaped together in collecting bins, drop by drop the juice seeps from these raisined grapes, there is not enough to fill a barrel so this rare liquid is transferred into glass demijohns and taken down into Royal Tokaji’s deep, dark, historic cellars. In the cool cellar conditions a gentle change gradually occurs, over seven years, transforming the sugar, acids and flavours of the grapes into a unique, perfumed, unctuous syrup so rich that it can only be sipped. The Tokaj region lies 240km north of Budapest, Hungary, and has long been famous for its Aszú wines and was Europe’s first classified wine region. Over the centuries the legendary Tokaji wines have been enjoyed by Louis XV, Frederick the Great, Catherine the Great, Napoleon III, Queen Victoria, Thomas Jefferson, Voltaire, Goethe, Hayden, Beethoven, Liszt and Schubert, to name but a few. 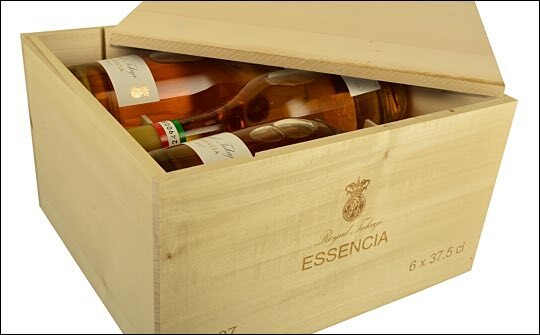 Royal Tokaji Essencia 2007 will retail at around £320 a bottle under bond in the presentation box and £1,800 for six bottles in the wine merchants wooden box.